It’s always a pleasure when Arthur Brooks, President of the American Enterprise Institute, comes to town; he’s an engaging speaker, a thoughtful leader, and really an all around fantastic guy. That’s why it was such a privilege to sit down with him last week in the Acton Studios after he delivered his latest Acton Lecture Series Address last Thursday to record this week’s edition of Radio Free Acton. 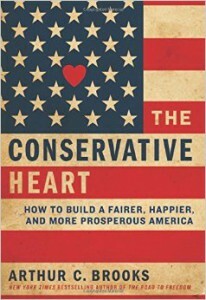 We talked about the message of conservatism, how it often gets bogged down in facts and statistics, and how conservatives can better communicate their core principles to a public that is often quite skeptical of our motivations. You can listen to the podcast via the audio player below, and stay tuned to the PowerBlog for video of Brooks’ ALS address, which will be posted a bit later this week. Posted in Audio, Radio Free ActonTagged AEI, american enterprise institute, Arthur Brooks, arthur c. brooks, conservatism, culture, happiness, podcast, radio free acton, society, The Conservative Heart, washington d.c.